Volunteering is a great way to make a difference in the community. It is a chance to make a difference in the lives of those who do not have a voice. At Dove Creek Equine Rescue we welcome those that want to help! Volunteer opportunities will depend on your skills and abilities. If you have a talent or expertise that you think we could use and would like to offer it, please let us know. We appreciate your support! Youth 12 and over and adults are welcome! If under 12 must be accompanied by a parent or guardian. All volunteers start at beginning level with the option of moving to our most advanced level - evaluated by staff. If you want to help with facilities maintenance or equipment maintenance on another day, call Frank Castillo at 877-322-5622 to schedule. Meet Erika… Our volunteer coordinator. Find out more information about getting involved at DCER! Rope Halters - all sizes and lead ropes - mini horse size too! 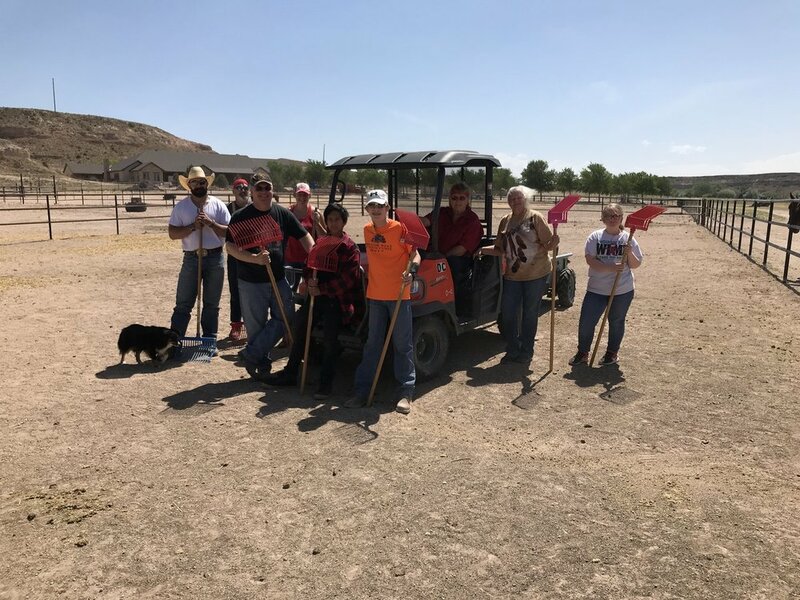 After the chores are done, our Dove Creek Volunteers will be able to learn from Frank Castillo our head trainer as he completes a training session in the round pen with one of our rescue horses. We welcome those who want to assist in the fundraising opportunities at the rescue! We are always looking for additional marketing and public relations help! Contacting media for events and activities. Frank Castillo - our head trainer - works with all volunteers. We do our best to accommodate more equine training education and one on one time with horses. The Volunteer Training Program is focused on proper handling of horses, basic ground training, grooming and of course safety. These are key factors needed when working with and training horses. Our ranch foreman and trainer, Frank believes horses need enough time in the herd to become ready for training - where they will face their fears with the previous humans in their lifetime. But what's fascinating about him is that he understands a horse who has been through trauma because Frank remembers when he didn't trust people and when that led to sometimes of pain.